Alexander Repenning has a new version of his OpenGL code for MCL which has a lot of new features. Model Loader: load simple .obj model files. Multi View Animation: Run serveral animated windows or views in parallel. Texture and Image Loaders: load virtually any image file format including alpha channels to make textures and images. 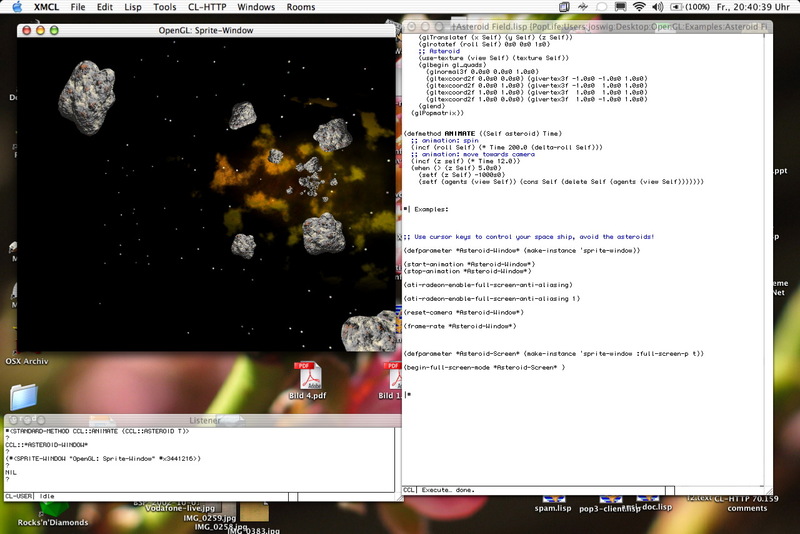 OS X Full Screen Mode: run OpenGL applications in full screen mode. Ideas for games or other highly emersive visual environments. 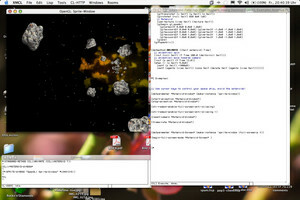 OpenGL Views: use any number of OpenGL views inside windows. Combine OpenGL-Views with other MCL dialog items into sophisticated dialog boxes. Real Time Animation: implement frame rate independent real time animations, and simulations. Game Engine: A simple game engine allows you to construct scenes containing agents. Agents can be nested. Agent can be animated, can react to events etc. Full Scene Antialiasing: ATI Radeon video boards only. Live Interface: drag and resize the window; change the camera angle... all without ever halting the animation.